Magic Dust is amazing for cooking “barbecue style” food, but there's unlimited ways you can use it every day. Magic Dust works with almost everything! Everyone loves a barbecue – now your outdoor cooking can be even more delicious. Just sprinkle your meats with Magic Dust a few hours before cooking, and let the delicious flavours infuse. Rainy or cold outside? Don't worry – you can cook with Magic Dust all year round, indoors and out. 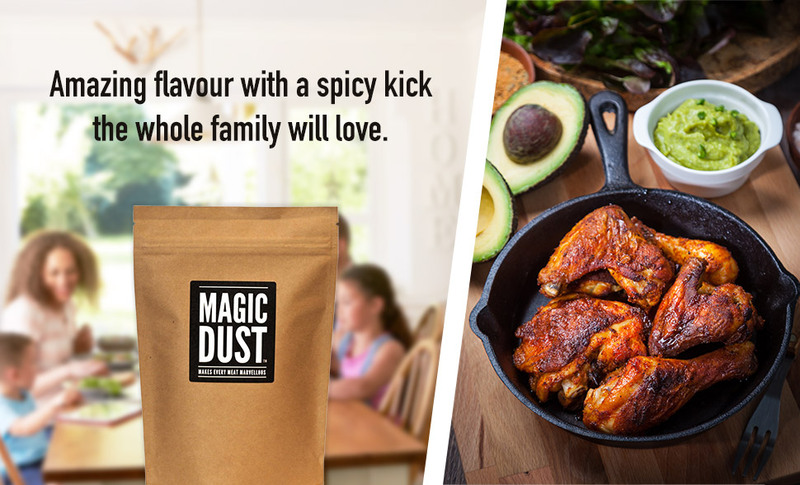 Pulled pork, chicken wings, beef and more – Magic Dust adds rich flavours and a spicy kick to every kind of food. Trying to eat healthier? Enjoy lean meats and vegetables with big flavours – just add some Magic Dust before cooking! Lower in salt than many seasonings, so you can get the most flavour possible during your diet. We don't add any artificial fillers, flavourings, chemicals or preservatives, just quality spices. Paprika, Chilli Powder, Cumin, Garlic, Pink Salt, Light Muscovado Sugar, Mustard, Black Pepper, Cayenne Pepper. Contains Mustard. May contain nuts. We're proud to say that our spice mixes are blended and packed in the UK, supporting local business.